CHICAGO (PAI) — The Amalgamated Bank of Chicago, one of the few labor-backed U.S. financial institutions, will use the $35 million it just gained from sale of its old headquarters to help expand its services and products for workers, its chairman says. The bank, founded by the Amalgamated Clothing Workers in 1922, was at State and Monroe in Chicago’s Loop until Sept. 7. Its new main office is several blocks away on LaSalle Street, with its management on two floors of that skyscraper. Its 192 workers — 185 downtown and seven in the suburb of Warrenville-are members of Workers United, a Service Employees sector and one of the union “heirs” of the old Amalgamated Clothing Workers. Unions own 15 percent-20 percent of the privately held bank’s stock and half of its board, including representatives of the building trades and the Teachers, are union members, board chairman Rob Wrobel said in a telephone interview marking the new headquarters. “Our union base is very important to us,” Wrobel said just after the move. “As a privately held institution, going into the capital markets is very costly” when the bank wants to help unions, their members and small businesses that get loans while using union labor. From the building sale, “We can lend them more dollars and continue to serve them,” he added. Part of that service is educational, Wrobel explained. When small businesses approach the Amalgamated Bank for loans, its officials sit down with them and explain the benefits of using union construction workers and Project Labor Agreements to expand their facilities. And the bank signed a PLA with local unions for build-out of its new space on LaSalle Street, too. But the Amalgamated Bank finds itself competing against the “big boys” for lending to businesses and for projects, Wrobel says. Even small construction projects attract institutions such as the Bank of New York-Mellon and JP Morgan Chase-financial behemoths whose 1920s predecessors refused to lend to workers and unions. They kept those bans for years. That financial discrimination led to the founding of the Amalgamated Bank. Originally in both New York and Chicago, it split several decades ago after federal regulators raised questions. Workers United owns the Amalgamated Bank of New York, which also has a D.C. branch. Lender discrimination also led to founding of the Union Labor Life Insurance Company (ULLICO) in 1927 and the Kansas City-based Boilermaker-owned Bank of Labor in 1924. Those other labor-backed financial institutions have also expanded recently. The Chicago bank’s move to new headquarters came a month after the Bank of Labor opened a branch in D.C., a block from the AFL-CIO headquarters, at a ceremony attended by AFL-CIO President Richard Trumka and Mine Workers President Cecil Roberts, among others. The Chicago bank, like the others, funds projects that employ union workers, benefit union workers, or both. The bank has $795 million in assets and its trust department administers $11 billion in Taft-Hartley and multi-employer funds, for example. Many of the Chicago bank’s loans go to unions who sell old headquarters, on more-valuable land, and erect new offices, or to finance housing for middle-income and low-income workers, Wrobel said. That’s similar to the other pro-union institutions. ULLICO, for example, invests much of its money in housing, hospitals and businesses for workers-and even in religious institutions. “In today’s world, we’re not one of the megabanks, but we’re competing with all the players,” Wrobel adds. Photo: The wonderful old Bailey Brothers’ Building and Loan was a longtime irritant to Mr. Potter, the richest man in town. 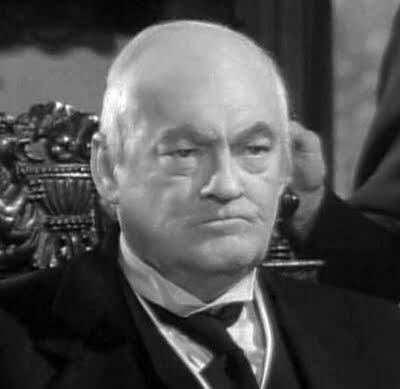 “Lionel Barrymore as Mr. Potter” by Liberty Films – Cropped screen capture from film “It’s a Wonderful Life.” Licensed under Public Domain via Commons.